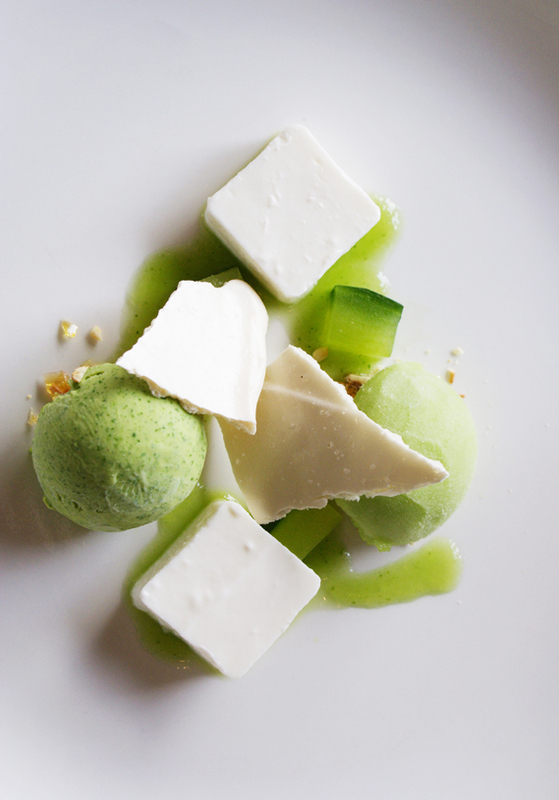 Another divine desert, this time coconut panna cotta, coriander ice-cream and cucumber sorbet. Almost too beautiful to eat. Almost. But not quite! I love birthday parties. And I rather liked the one I was invited to a couple of weeks ago. Tokara was celebrating the first year of Richard Carstens in the kitchen. As always it was lovely seeing Richard, as well as Holy Trinity that is Wilhelm Kuhn, Johan Terblanche and Jaap-Henk Koelewijn who are responsible, as they modestly put it, for the management and running of the restaurant. This fact was refuted by GT Ferreira, who in a lovely speech, referred to them as the true owners and that he himself was merely the lessor. Hmm, he can afford to be generous. Specially when it's his William Kentridge hanging in the restaurant. There was such a happy atmosphere and the affection and respect that all parties involved with the restaurant feel for one another was obvious. The wine was excellent, the company great, and the food, as always, was sublime. The article below was originally published in the Summer 2011 issue of Cape etc. Chef Richard Carstens is on top of things. Literally and figuratively. Perched high on the Helshoogte Pass, the new chef of Tokara appears to like the view. On a slightly overcast morning on the terrace of Tokara over coffee (mine) and cigarettes (his) while chatting about the tasting menu he had served us the previous night, a weird thought popped up in my head: that I had never, in all the years, and quite a few interviews, ever seen multiple award-winning chef Richard Carstens eat anything. The thought was disconcerting because he has probably watched me eating and studied my response to food with more intensity than any other dining companion ever has. It’s unsettling at first, knowing that you are being studied in such a manner. Knowing that the creator of the food you are about to eat will be watching your every response to the plates and tastes he has placed before you. But your initial discomfort soon gives way to something altogether more pleasant. Wonder. 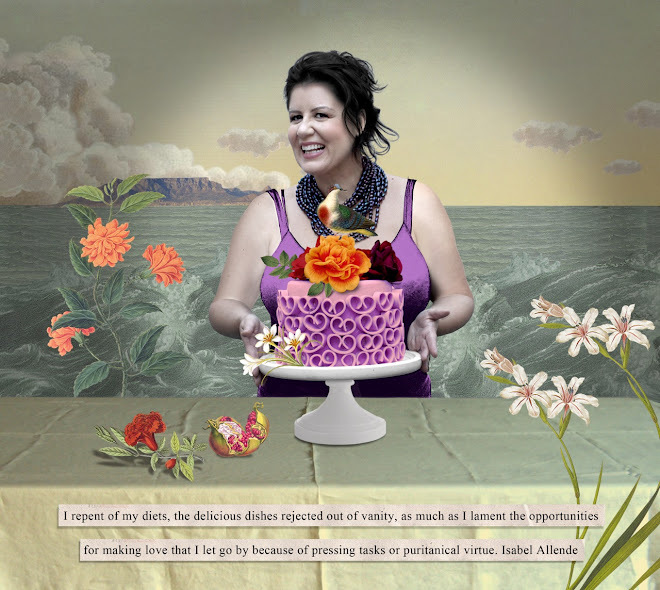 The food Richard Carstens creates fills me with wonder. Over the years I have enjoyed Gorgonzola ice-cream served with poached pear in a red wine and honey sauce (Le Provencal, Franschhoek 2000). I have been swept off my feet by seven courses of foie gras - a study in tastes and textures, where the highlights were ‘semi-liquid’ foie gras with nuts, nougat and almond milk froth; a sweet foie gras churros served with a coffee and hazelnut praline and milk skin; foie gras served with roast beetroot, yoghurt, lemon and tiny pieces of magenta-coloured beetroot ‘styrofoam’ and a meaty foie gras ice-cream in a sweet caramel casing served with Japanese curried vegetables (Lynton Hall, Pennington, KZN 2005). And I fell completely in love with a creamy panna cotta landscape dotted with colourful drops of a variety of intense fruit coulis, which was almost too beautiful to eat, but which, when I did, tasted sublime. (Nova, Cape Town 2009). More recently a fossilized (yes, really) parsnip, served with mushroom soil, honeycomb, pear and truffle and which is meant to be eaten by hand was rivaled only a meat-textured –coloured-looking watermelon carpaccio that played havoc with my mind. In a good way But is was the Rose Geranium sorbet that claimed my heart (Tokara, Stellenbosch 2011). So it’s not exactly steak and chips. But don’t be put off. Because to be put off, means to deny yourself the absolute joy of looking and tasting food in a completely new way. Because Carstens will forever change the way you feel about food, will challenge what you’ve always believed about food and flavours. As a chef, he had pretty inauspicious beginnings, cooking for the first time when he was conscripted into the army and decided that wielding a spatula was infinitely preferable to wielding a gun. And so he spent his military training in the kitchen at the Castle in Cape Town. Cooking for the troops, making pies and stews for 300 and more soldiers, and baking Hertzoggies and milk tarts for various functions, could hardly be described as inspiring. But it was beginning. And he went on to train under Ralph Pletzen at his eponymous restaurant Ralph’s in Stellenbosch in the early 90s. He then moved to the Franschhoek region where he worked at the likes of Chamonix, Monneaux, Le Provencal and Bijoux, ensuring that the both Le Provencal and Bijoux made the Eat Out Top 10. In 1997 and 1998 he went to Melbourne Australia where he worked at Le Japon increasing his knowledge and indulging his fascination Japanese cuisine. He came back to South Africa brimming with ideas and went to Lynton Hall in Kwazulu Natal, where he made the Eat Out Top 10 for four consecutive years, and was awarded Chef of the Year in 2005. In 2007 he moved back to Cape Town, bringing with him all his painstakingly detailed journals, noting recipes, combinations, inspirations, timings, and who ate what where. Ok, he brought them all, bar the few that he left on a plane one weekend such was his haste to see his then girlfriend, now wife, Tracy. He feels that loss acutely, but slowly and surely those who worked with him are filling in the blanks. In 2009 he created a stir amongst foodies when he headed up the kitchen at Nova in Cape Town, but while his success was not short-lived the restaurant was, closing unexpectedly and leaving a trail of disappointed fans who liked to eat the style of food that Richard was so incredibly good at. Fans who can now happily eat at Tokara. While some may insist on definitions in order to make sense of this culinary magic, Richard balks at the terms ‘Molecular Gastronomy’ or ‘Deconstruction Cuisine’. The one he is most comfortable with is Avant-garde cuisine, but to him, his style of cooking is simply a way of focusing on the essence of flavours. Richard Carstens is both dead serious about and enormously playful with food. What he does requires a vivid imagination, extensive scientific research and endless experimentation. He takes ingredients so far away from their original form or ‘setting’, yet the essence of those flavours aren’t altered. As he so beautifully puts it, ‘I want the ingredient to speak for itself, but in many different languages.’ His favourite kitchen utensils are a thermometer and a clock, because so much of what he does is based on temperatures and timing. He questions those who say that they cook only with their heart, with what feels right, because Richard believes in precision as well as passion. But while he is extremely comfortable with science, he is also at heart an artist, drawing inspiration from the likes of Joan Miro, Mark Rothko and Richard Prince. The dishes he plates are transient works of art. As appealing as they are, you won’t want to tuck in immediately, there will be a slight hesitation, a moment of regret at having to spoil the image, before taking the first bite. It’s a respectful thing, this waiting. You’ll do it too. Because once you’ve appreciated the dots of colour, the linear patterns, the perfect placements, you will understand that one eats not only with the mouth but with the eyes as well. Richard also believes in fun. And so will you, if you eat and taste and experience with an open mind. But even if you are unadventurous, you will not find the food at Tokara, where he has now taken up residency, strange or alienating. This is after all a man, who owns and uses a copy of that South African classic with the outdated and appallingly-styled photos, Kook en Geniet. But, having said that, The Kook en Geniet stands alongside volumes of books such Essential Cuisine by Michel Bras, who according to Richard is the real father of Avant-garde Cuisine. ‘He has a huge following among the young chefs in Spain, ‘Richard enthuses, ‘even Ferran Adria pays homage to him in one of his books, because he’s the ‘high priest and genius of deconstruction cuisine.’ Clorofillia by Andoni Luis Adulriz of Mugaritz fame has also been a great source of inspiration for many years. ‘His study of herbs is phenomenal and the aesthetics of his plates are very Zen. Aduriz is the Picasso of cooking.’ asserts Richard. And of course there are the tomes of Ferran Adria, for whom Richard once had the privilege of cooking, fulfilling a long-held dream in 2009, when Ferran Adria visited South Africa to be a keynote speaker at the Design Indaba. Topsi Venter, seventy-something doyenne of South African cuisine had been asked to cook for Adria, his hosts and guests at a private function. She asked Richard, who considers her his spiritual mother and mentor, to help plan the menu and cook alongside her. Having spent a whole night speed reading the cookery books of Dr C Louis Leipoldt (1880—1947) the famous South African poet, writers and cookery buff, Richard told Topsi that they should cook the flavours from their heart. According to Topsi ‘Richard was insistent that we cook the way I always do. He said that Adria was coming here to see what we do. To taste our food. So nothing should look or taste like anything Adria had ever done.’ And so they presented the greatest chef in the world with the likes of pickled fish, dried banana chips and coconut; biltong pate, apricot leather and rocket leaves on vetkoek; crayfish and indigenous khoi plants; yellow peaches soaked in brandy syrup; koeksusters; soetkoekies and traditional milktart. There is the wide-held misconception that Richard trained under Ferran Adria, but it’s not true. What is true is that he is probably the very first South African chef to take note of what was being done at El Bulli, in a small town just outside Barcelona many years ago. Because like Adria, Richard Carstens is a chef that has always been ahead of his time. It’s an uncomfortable place to be in, and he has on occasion been misunderstood, but those few detractors are now eating their words as well as his food, because the rest of the South African chefs have caught up, and what was once thought of as strange is now simply regarded as fine dining. So at Tokara, the elegantly austere restaurant owned by businessman and art collector (take note of the enormous William Kentridge in the restaurant) GT Ferreira and operated by Wilhelm Kuhn, Johan Terblanche and Jaap-Henk Koelewijn, Richard is free to create. Free to make the food is so extraordinarily good at. The tasting menu is where his creativity is shown to its best advantage, while the selection on the a la carte menu is proof of that Richard can make ostensibly ordinary dishes, truly spectacular. Because he respects ingredients. So a beautifully peppered Springbok fillet will be served with a parsnip puree, beetroot croquettes and hibiscus jus. He can’t resist the hibiscus jus – a little unexpected something to enhance a dish. And what is a meal without dessert? And Richard is the master of desserts, despite his own affection for Diary Milk Fruit and Nut, and having once admitted to liking shop-bought chocolate eclairs. But here his obsession truly pays off, where his creativity finds the perfect platform. A dessert of lemon mascarpone mousse, white chocolate sorbet, meringue and almond financier is a study of pale whites tinged with hints of lemon, and while the dessert is light, the flavours evoke a warm lemon pudding, comforting despite its delicacy. He has created sorbets which are silky smooth and bursting with pure flavor, the not-so-secret method, something he gladly shares with other chefs. Because Richard is generous that way. For him, it doesn’t appear to be all about the accolades, it’s about an exchange of ideas. And his intensity is contagious; you can’t help but be caught up in his obvious excitement. And he is not precious about what he does. There is not a hint of arrogance, only an excitement for his chosen profession, a willingness to share his obsession. He believes in training young chefs well. He wants to see them challenged. He wants them obsessed. Inspired. And he is succeeding, because high on the Helshoogte Pass, overlooking the Stellenbosch valley, there is magic in the air. And on the plates.